Bangsar, 20 th February – Nivedhan Naysaduray, Vineeth Suresh, Vijay Karan, and Sarah Parmar have an average age of just 24 yrs, but already these young millennials have cemented themselves as entrepreneurs in Malaysia’s start-up node, Bangsar. The young and dynamic ensemble, recently joined Malaysia’s ever growing entrepreneur circle with the launch of Savage, a bar that brings an edgier feel to Bangsar’s nightlife scene. The streets of Jalan Telawi welcomed its latest addition on the 20 th of November 2016. Savage, with its unmistakable purple hue, was the brainchild of its four enterprising founders who were inspired to turn their love for the food and beverages and entertainment industry into an avenue where they could share their passion with fellow party-goers. Savage offers patrons with a cosy set-up, entertaining music, and drinks at bargain prices that make it an ideal spot to relax after-hours. “From the get-go, we set-out to create a venue that can be enjoyed by those who share our love for hip-hop, R&B, and old school music. When it comes to our menu, we offer an assortment of beverages that satisfy the wants of those who look to us as a spot to socialise and have a great time,” said Vineeth Suresh, Director of Savage. Keeping with the entrepreneurial spirit, Savage also provides a platform for up and coming disk-jockeys. Among the talents that wow party-goers include, Zami, Ziqq, Lil J, Brian, Dinesh, and Jay. Its weekly events include, #StraightOuttaClass on Tuesdays and Wednesdays, #ThirstyThursdays on Thursdays, #FreakyFridays on Fridays, and #SavageSaturdays on Saturdays, that cater to different age groups and offer tailor-made promotions. “By offering a variety of events on a weekly basis, we have managed to accrue patronage from different age groups, from working adults to college students. Working with high calibre entertainers and providing eye-catching promotions has increased the exposure of our brand by a considerable amount since we first opened our doors,” said Sarah Parmar, Director of Savage. Its spacious layout makes Savage a perfect venue for get-togethers, parties, reunions, fundraisers, and corporate events. The bar is able to accommodate between 100 to 120 pax and offers a long list of household brands of liquor, wine, cocktails, and beers that will satisfy even the most discerning taste buds out there. “At Savage we offer great music, beverages at premium prices, and an ambience that is cosy and inviting. Our goal is for our customers to make this their go-to spot for fun and a great time. 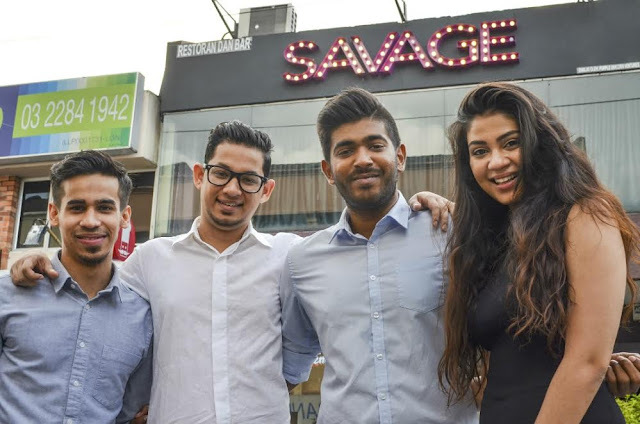 Regardless of whether you are looking to host an event or have a relaxing night out with your friends, Savage is the place to be,” said Nivedhan Naysuduray, Founding Director of Savage. The arrival of Savage comes at a time when Bangsar’s nightlife is thriving with bars, restaurants, cocktail lounges, teahouses, and coffee houses filling up the grid of streets outside of Bangsar Village. Despite visitors having a long list of outlets to choose from after dark, Savage’s owners are confident that this will not deter their success, if anything, it would only serve to increase the patronage of the bar. https://www.facebook.com/savage.bangsar/ or contacting them directly at +6016 238 3090.